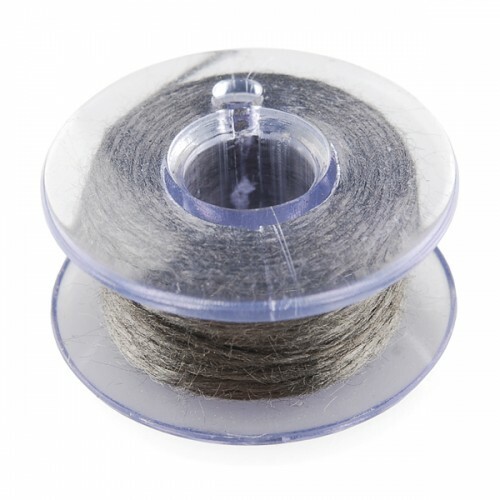 What sets this thread apart from the other conductive thread that we carry is the fact that it’s actually spun from this stainless steel fiber and doesn’t have a nylon core. This means that while it may not be easy to solder to, because it’s stainless, it also won’t burn up when you touch it with a soldering iron. Suitable for hand or machine sewing (as a bobbin thread), it’s particularly ‘toothy’, which means that it grabs tight to your fabric- if you’ve had problems with slippery conductive thread that won’t lay flat or knot, this thread will be a welcome relief. We’ve had no trouble using it for close, tight connections, but if you’re worried, waxing the thread should keep it manageable!